It seems that no matter what value I set for the editors-xtd 'buttons' attribute, no buttons are shown. There is one exception, if the attribute is set to true, all buttons are shown. In the context of my component, only the article and image buttons are applicable. 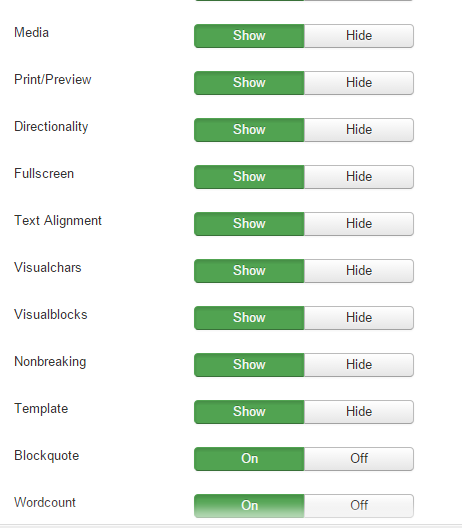 The documentation seems to indicate that the 'buttons' attribute should include an array of buttons to be excluded, in this case, pagebreak and readmore. I have tried a number of things, none of which have had the desired result. How does this actually work? Thank you for your help. buttons = "true" | Show all buttons. hide = "article,image" | An array of the buttons you want to hide. When instantiating the editor directly in your source code you can provide an array of buttons that should be hidden to the display method of the editor. Not the answer you're looking for? Browse other questions tagged joomla-3.x xml editor form-fields-types or ask your own question.